The words “Stanford” and “prison” bring to mind a slew of images, most notably those of the infamous Stanford prison experiment in the 1970s. This year, however, these two words reference TAPS 20N: “Prisons and Performance,” a freshman introductory seminar. The class fixates on the question: What can the performing arts elucidate about mass incarceration in America? The seminar approaches the social issue of mass incarceration through the lens of dance and theater. Taught by drama professor Janice Ross, the class explores works that involve incarcerated individuals in various roles, ranging from authors and choreographers to subjects and performers. In order to offer students a truly immersive experience into the daily lives of the 2.4 million people behind bars today, TAPS 20N includes field trips to U.S. prisons and conversations with formerly incarcerated youth, lawyers and prison staff. The interdisciplinary nature of the class excites many students who wish to bridge their interests in performing arts and social reform. Ross, who previously taught a version of this class geared towards graduating seniors, is inspired by the energy freshmen in particular bring to the seminar. 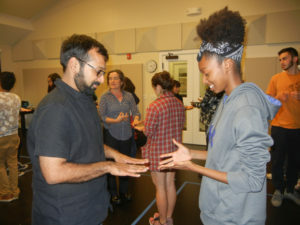 “The best experience has been seeing the level of investment, rigor and passion the remarkable group of 20 students bring to the class each week and the sense of supportive community that is evolving,” Ross wrote to The Daily, adding that TAPS 20N aligns well with her own new project connecting dance and theater with incarcerated populations. In the 10 weeks they have together, students in TAPS 20N tackle complex questions relating to the role of art in society. Moreover, by studying prison inmates, students can brainstorm ways to use theater and dance to affect social change and personal transformation for the incarcerated, according to Ross. For some of the students, this is a little out of the ordinary but still exciting. “I told myself that part of my college experience was making sure that I went out of my comfort zone and tried new things, and this class seemed like the perfect fit,” Vinh Ton ’20 said. Contact Anjini Karthik at anjinik ‘at’ stanford.edu.